Weed, CA – July 30, 2011– The Weed Chamber of Commerce is excited to announce the official talent lineup, for the 1st annual 4&20 Blackbird Music Festival. Thanks to Radio Star and the Mongo Party for coordinating such headliners as One-Eyed Doll, Merle Jagger, Air Dubai, Domeshots, Invisible Animals, Haunted by Heroes and State Line Empire. 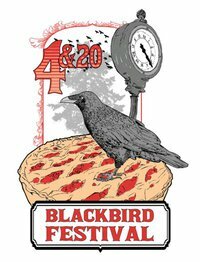 Scheduled for the last week in July (Saturday, July 30th), the 4&20 Blackbird Music Festival brings together over 50 bands and musicians for a huge musical event benefiting the city of Weed, CA. by fundraising for a street clock for the downtown area. The festival is set to kick off at 11:00 am along Main Street in downtown Weed. Festival goers can purchase tickets at the door for $5 per stage or they may opt for the “Mongo Pass” set at $15 which will give them access to all 5 stages of music for the day. Tickets will be sold at the festival as well as on the website www.4and20festival.com. 5 stages will encompass local venues in downtown Weed. Venues include: RadioStar Studios (Bigfoot Stage), Cedar Lanes Bowling Alley (City Stage), Papa’s Place (American Stage), Black Butte Saloon (Goldrush Stage) and an outdoor stage on Main at Lake Street which has been dubbed the Blackbird Stage. The event also promises a two-city block street fair that features live music, visual art, local food, and an array of unique items. The outdoor portion of the event will be the length of Main Street from W. Lake Street to W. Division Street in downtown Weed. The street fair will incorporate local delicacies including homemade pies, organic chocolates, fine crafted items from artists near and far, as well as delicious food, cold beer, and plenty of things to do for the whole family. During the event, RadioStar Studios will open to the public for the first time in 10 years. The historic building was once the old Weed Palace Theater, which has now been converted into a cutting edge music production studio. For more information, including the complete artist line up, directions and local accommodations, please visit the website at http://www.4and20festival.com.